Type 2 diabetes mellitus (T2DM) induces dementia and cognitive decrements indicating the impairment of the central nervous system. While there is evidence showing abnormalities in white-matter structural networks in T2DM, the topological features of gray matter are still unknown. The study enrolled 30 right-handed T2DM patients and 20 healthy control subjects with matched age, gender, handedness, and education. Graph theoretical analysis of magnetic resonance imaging on gray matter volume was conducted to explore large-scale structural networks of brain. Although retaining small-worldness characteristics, the structural networks of grey matter in the T2DM group exhibited an increased clustering coefficient, prolonged characteristic path, decreased global efficiency, and more vulnerability to random failures or targeted attacks compared with controls. Additionally, the degree of structural networks in both T2DM and control groups was distributed exponentially in truncated power law. Our findings suggest that T2DM disturbed the overall topological features of gray matter networks, which provides a novel insight into the neurobiological mechanisms accounting for the cognitive impairment of T2DM patients. The online version of this article ( https://doi.org/10.1007/s11682-019-00070-2) contains supplementary material, which is available to authorized users. This study was supported by the National Natural Science Foundation of China (Grant no. 81371526). All procedures followed were in accordance with the national health and Family Planning Commission “biomedical research involving human ethics review approach” (the National Health Commission Order No. 11), “Helsinki declaration” of the World Medical Association, the ethical principle of CIOMS “International Ethical Guidelines for Biomedical Research Involving Human Subjects”. Informed consent was obtained from all patients for being included in the study. Cui, Y., Jiao, Y., Chen, Y. C., Wang, K., Gao, B., Wen, S., … Teng, G. J. (2014). Altered spontaneous brain activity in type 2 diabetes: A resting-state functional MRI study. Diabetes, 63(2), 749–760. https://doi.org/10.2337/db13-0519. Espeland, M. A., Bryan, R. N., Goveas, J. S., Robinson, J. G., Siddiqui, M. S., Liu, S., … Group, W.-M. S. (2013). 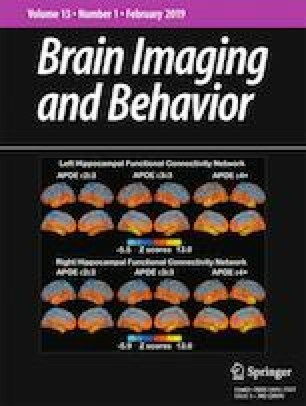 Influence of type 2 diabetes on brain volumes and changes in brain volumes: Results from the Women's Health Initiative magnetic resonance imaging studies. Diabetes Care, 36(1), 90–97. https://doi.org/10.2337/dc12-0555. Gold, S. M., Dziobek, I., Sweat, V., Tirsi, A., Rogers, K., Bruehl, H., … Convit, A. (2007). Hippocampal damage and memory impairments as possible early brain complications of type 2 diabetes. Diabetologia, 50(4), 711–719. https://doi.org/10.1007/s00125-007-0602-7. Hosseini, S. M., Black, J. M., Soriano, T., Bugescu, N., Martinez, R., Raman, M. M., … Hoeft, F. (2013). Topological properties of large-scale structural brain networks in children with familial risk for reading difficulties. Neuroimage, 71, 260–274. https://doi.org/10.1016/j.neuroimage.2013.01.013. Hosseini, S. M., Mazaika, P., Mauras, N., Buckingham, B., Weinzimer, S. A., Tsalikian, E., … Diabetes Research in Children, N. (2016). Altered Integration of Structural Covariance Networks in Young Children With Type 1 Diabetes. Hum Brain Mapp, 37(11), 4034–4046. https://doi.org/10.1002/hbm.23293. Shimoji, K., Abe, O., Uka, T., Yasmin, H., Kamagata, K., Asahi, K., … Aoki, S. (2013). White matter alteration in metabolic syndrome: Diffusion tensor analysis. Diabetes Care, 36(3), 696–700. https://doi.org/10.2337/dc12-0666. Tzourio-Mazoyer, N., Landeau, B., Papathanassiou, D., Crivello, F., Etard, O., Delcroix, N., … Joliot, M. (2002). Automated anatomical labeling of activations in SPM using a macroscopic anatomical parcellation of the MNI MRI single-subject brain. Neuroimage, 15(1), 273–289. https://doi.org/10.1006/nimg.2001.0978. van Bussel, F. C., Backes, W. H., van Veenendaal, T. M., Hofman, P. A., van Boxtel, M. P., Schram, M. T., … Jansen, J. F. (2016). Functional brain networks are altered in type 2 diabetes and prediabetes: Signs for compensation of cognitive decrements? The Maastricht study. Diabetes, 65(8), 2404–2413. https://doi.org/10.2337/db16-0128. Zhang, J., Liu, Z., Li, Z., Wang, Y., Chen, Y., Li, X., … Zhang, Z. (2016). Disrupted white matter network and cognitive decline in type 2 diabetes patients. Journal of Alzheimer's Disease, 53(1), 185–195. https://doi.org/10.3233/JAD-160111. Zhang, Y., Qiu, T., Yuan, X., Zhang, J., Wang, Y., Zhang, N., et al. (2018). Abnormal topological organization of structural covariance networks in amyotrophic lateral sclerosis. Neuroimage Clin. https://doi.org/10.1016/j.nicl.2018.101619.